Rabbits are social animals and can be comforted by the presence of a companion. Owners who have a limited amount of time to interact with their rabbit may want to consider adding another rabbit to provide companionship. Rabbits may be particular in their choices of companions and may not always get along when introduced as adults. When introducing two rabbits, it is important to gradually acclimate the rabbits to each other to prevent an extreme reaction that could lead to injuries in either rabbit. Many experts recommend group housing rabbits only if the process is done gradually or if both the rabbits are altered, or fixed. •	History of the rabbits. Littermates tend to live together in greater harmony. Littermates are already accustomed to the mannerisms of each other because they have been raised together since birth. Non-littermates still make great companions, but they will tend to have disagreements when they are first introduced. •	Reproductive status of the rabbits. Rabbits that are altered tend to be more agreeable toward each other. A female rabbit that is not spayed will tend to exhibit aggressive behavior periodically throughout the year due to reproductive hormones. This aggression may be directed to another rabbit in the cage. Unneutered males will also tend to be more aggressive and may show dominant behavior over a less assertive rabbit. Spaying and neutering rabbits also prevents the occurrence of unwanted litters. As a rule of thumb, neutered male rabbits tend to live best with spayed female rabbits. •	Care requirements for two rabbits. Although it is nice to have two rabbits housed together, it does not necessarily mean that there will be less work. In fact, two rabbits require double the amount of work, regardless of whether they are housed together or not. Housing two rabbits together will also require a larger cage to accommodate a proper space allotment per rabbit. 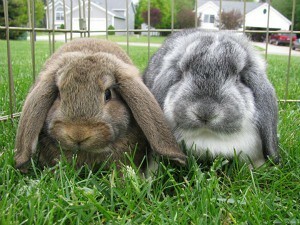 Having two rabbits will also lead to double the expenses at the feed store, veterinarian’s office, and pet store. •	Purpose of the rabbits. Because rabbits are social creatures, they will bond with the individual that they are in contact with the most; this can be either a human or a rabbit. In other words, if you plan to have your rabbit as a companion, you may only want to have one rabbit in a cage. Rabbits that are housed together will tend to bond with each other more than with their human caretakers. •	Keep the rabbits in separate cages for the first introduction. Gradually place their cages closer together. This technique will allow the rabbits to begin to associate with each other without allowing physical interaction. Owners should practice caged introduction as often as possible. The longer the rabbits are exposed to each other, the more smoothly the first physical interaction will be. •	Introduce rabbits on neutral territory. The first time the rabbits are allowed to physically interact, it should be done in a neutral area of the house or yard. If the introduction is done in familiar territory marked by urine or other scents, one or both of the rabbits may see the other as an "intruder" and react aggressively. A clean room in the house is a perfect area to introduce rabbits for the first time. •	Have rabbits wear harnesses or leashes for the first physical introduction. At first, rabbits should not be allowed to get too close to each other, but after regular interaction they can be allowed to interact. Wearing harnesses or leashes allows the rabbits to smell and get acquainted with each other, but it also allows for you to pull them away in the event of a sudden fight. •	Watch for hostility between rabbits. After you have let the rabbits interact with each other while wearing harnesses and leashes, you can let the rabbits loose together as long as you watch them carefully. Initially, the rabbits may have minor struggles, but they should be able to work things out, especially if the rabbits are both altered. To be fully prepared for the first “official” introduction, owners may want to have a spray bottle filled with water. In the event of a fight, a spray bottle will help quickly stop any confrontation, hopefully before injuries occur. •	Use a clean cage. Before placing the rabbits together in the same cage, make sure to clean the cage thoroughly to ensure that it will have minimal territorial marking scents from the previous occupant. Ensure the cage is large enough to house both rabbits comfortably. •	Practice regular supervision for at least three weeks. Do not leave the rabbits together unsupervised until they have interacted appropriately for a period of at least three weeks. Rabbits may be more prone to aggression overnight when you are around to supervise them. Once your rabbits have been slowly acclimated, they will provide good companionship to each other. Rabbits housed together tend to have fewer problem behaviors and respond better to stress than those housed individually. Rabbits may also have improved immune function and overall health if housed in pairs.